In a previous blog post we saw that tens of thousands of Londoners were awarded decorations for gallantry or good service. What were the ceremonies like? Here are three personal accounts, one by a recipient and two by observers, of ceremonies at Buckingham Palace. Edward Brittain earned the Military Cross on the first day of the Battle of the Somme, 1 July 1916. Waiting to go over the top, his trench was crowded by men wounded earlier in the attack (Edward’s unit was not in the first wave) and the men in front began to panic. As he told his sister Vera, “It looked like a regular rot, and I can’t remember just how I got the men together and made them go over the parapet. I only know I had to go back twice to get them, and I wouldn’t go through those minutes again if it meant the V.C.” About 70 yards into the advance, Edward was hit and could go no further, despite his best efforts. Crawling into a shell-hole he was hit again. After a while he crawled back towards the British lines past the bodies of the dead and wounded from that morning’s attack. After 20 minutes crawling he was helped back into the trenches by two stretcher-bearers. When he was sent back to the UK to recover from his wounds, Edward ended up in the hospital where Vera was a nurse, 1st London General Hospital in Camberwell. “I came up to town on Tuesday the 16th, went to Buckingham Palace on the 17th at 10.30 am. Mother came with me in the taxi from home and I dropped her just outside the gates and drove in alone; I ascended a wide staircase and deposited my hat and stick in a sort of cloak room, keeping my gloves (your gloves), went up more stairs, was asked by an old boy in a frock coat what I was to receive, was then directed to another old boy who verified my name etc and told me to stand on one side of the room – a large room with portraits of royal personages round the walls. There were 3 C.M.G.’s, about 12 D.S.O.’s and about 30 M.C.’s* so it was a fairly small investiture. “We were instructed what to do by a Colonel who I believe is the King’s special private secretary and then the show started. One by one we walked into an adjoining room about 6 paces – halt – left turn – bow – 2 paces forward – King pins on cross – shake hands – pace back – bow – right turn and slope off by another door. The various acts were not read out, but the Colonel just called out ‘Receive the C.M.G.’ etc. Colonel so-and-so. “I attended to-day one of the public conferring of War honours by the King in the forecourt of Buckingham Palace. […] It was the Investiture of the Victoria Cross – that plain cross of bronze with the simple motto “For Valour” which is the most honoured and coveted military decoration in the world. The recipients were nine soldiers – an officer of the Royal Flying Corps, an officer of the Royal Army Medical Corps, five sergeants and two privates of the Line. “The forecourt was flooded with sunshine when at a quarter to twelve o’clock the King in the uniform of a Field-Marshal came out of the Palace attended by his Staff. The guard of honour was provided by the Grenadier Guards. With them was the band of the regiment. The soldiers who were to be decorated were seated on chairs. 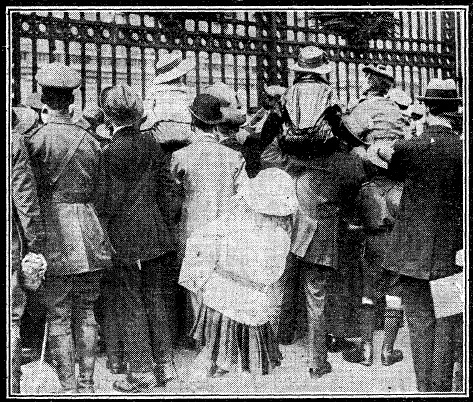 Civilians present were chiefly wives, mothers and children of the soldiers. 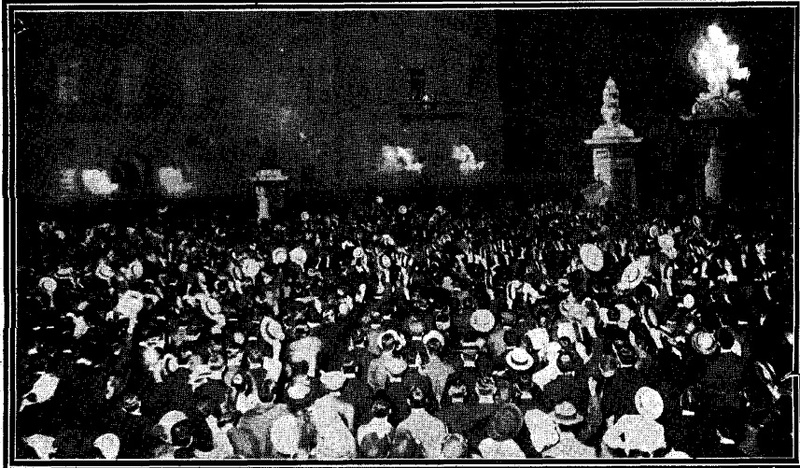 From the pavement outside the great sweep of the railings of the forecourt, and from the high steps and terrace of the Victoria Memorial, crowds of spectators obtained a view of the ceremony. “As each recipient of the Victoria Cross was presented to the King the official account of his valour was read by an officer. 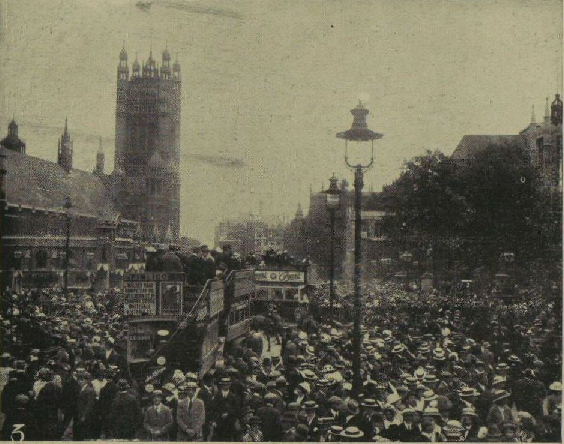 Neither the name nor a word of the record could be heard by the public outside the railings, but they cheered and clapped their hands all the same, well knowing that each story might worthily be proclaimed in trumpet tones to listening London. The King pinned the Victoria Cross on each hero’s breast, and having held him in conversation for a few moments gave him a warm clasp of the hand. The exploit of the non-commissioned officers and privates was the same in each case – putting out of action enemy machine-gun nests that were holding up a British advance. 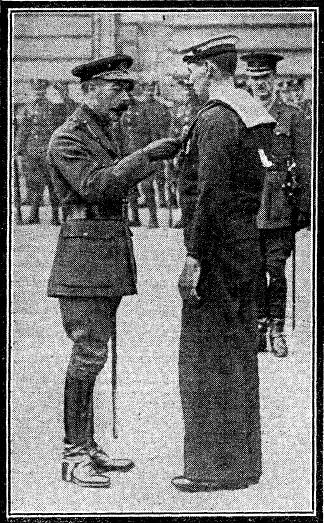 Remarkably there is a video of this investiture (see from 1.55), showing some of the men receiving their VCs, and Captain Ackroyd’s wife and son being given his VC and MC. Ackroyd’s Victoria Cross was awarded for his extreme bravery in tending and rescuing the wounded in the first two days of the 3rd Ypres (aka Passchendaele); so impressive was his heroism that 23 separate recommendations for him to receive the honour were submitted. Sadly, he was killed less than two weeks later, searching for wounded men behind the front line. * CMG is the medal of a Commander of the Order of the St Michael and St George (although, see Yes Minister), DSO is the Distinguished Service Order, and MC is the Military Cross.